Een gezonde leefstijl waaronder letten op voeding, drinken (geen alcohol) en fysieke activiteiten heeft grote invloed op de ziektevrije tijd en overall overleving van darmkankerpatiënten. Als alcohol niet wordt meegerekend 42 procent minder kans op een recideif en te overlijden en als alcohol wel wordt meegerekend 51 procent minder kans op een recidief en overlijden. Dit blijkt uit de CALGB 89803 (Alliance) studie in de periode 1999 tot 2001 door de NCIS. The 91 survivors who had the highest healthy lifestyle scores had a 42% lower risk of death and a trend for reduced chance of recurrence than the 262 survivors with the lowest lifestyle scores. When drinking alcohol was included in the score, the 162 survivors with the highest lifestyle score had a 51% lower chance of death and a 36% lower chance of cancer recurrence than the 187 survivors who had the lowest healthy lifestyle scores. The associations were not driven by any particular lifestyle factor; body weight, regular physical activity, and a healthy diet were all important. Over a median follow-up of 7 years, the 91 survivors who had the highest healthy lifestyle scores (5–6 points) had a 42% lower risk of death and a trend for reduced chance of recurrence than the 262 survivors with the lowest lifestyle scores (0–1 points). When drinking alcohol was included in the score, the 162 survivors with the highest lifestyle score (6–8 points) had a 51% lower chance of death and a 36% lower chance of cancer recurrence than the 187 survivors who had the lowest healthy lifestyle scores (0–2 points). The associations were not driven by any particular lifestyle factor; body weight, regular physical activity, and a healthy diet were all important. 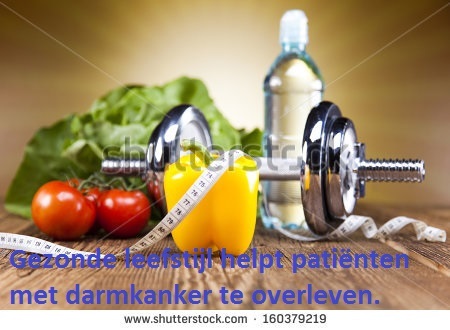 In deze studie vonden wij dat de recidiefkansen en overall overleving van darmkankerpatienten die deze ACS richtljnen volgden is gerelateerd aan een langere ziektevrije tijd en overall overleving. De studie: American Cancer Society (ACS) Nutrition and Physical Activity Guidelines after colon cancer diagnosis and disease-free (DFS), recurrence-free (RFS), and overall survival (OS) in CALGB 89803 (Alliance). wordt gepresenteerd op 2 en 3 juni op ASCO 2017. American Cancer Society (ACS) Nutrition and Physical Activity Guidelines after colon cancer diagnosis and disease-free (DFS), recurrence-free (RFS), and overall survival (OS) in CALGB 89803 (Alliance). Background: The ACS Nutrition and Physical Activity Guidelines for Cancer Survivors include: 1) healthy body weight; 2) physical activity; and 3) a diet high in vegetables, fruits, and whole grains. It is not known whether colon cancer patients who follow these guidelines have improved DFS, RFS, or OS. Methods: We conducted a prospective study among 992 stage III colon cancer patients enrolled in an adjuvant chemotherapy trial in 1999-2001. Lifestyle was assessed twice. We applied a score developed by McCullough ML et al. to quantify adherence to the ACS guidelines based on BMI; physical activity; and intake of vegetables, fruits, whole grains, and red/processed meats (range: 0-6; higher = more healthy behaviors). Alcohol is included in the ACS guidelines for cancer prevention, but not cancer survivors; we tested the score without and with alcohol using McCullough et al.’s cut points: 0 pts = >1/d for women, >2/d for men; 1 pt = no alcohol; 2 pts = >0-1/d for women, >0-2/d for men. We estimated hazard ratios (HR) and 95% confidence intervals (CI) for DFS, RFS, and OS adjusting for clinical, demographic, and lifestyle factors. Results: Over 7 y median follow-up, we observed 335 recurrences and 299 deaths (43 without recurrence). Compared to patients with 0-1 pt (262, 26%), patients with 5-6 pts (91, 9%) had 42% lower risk of death (HR: 0.58; 95% CI: 0.34, 0.99; p-trend: 0.01) and a trend toward improved DFS (HR: 0.69; 95% CI: 0.45, 1.06; p-trend: 0.03). When including alcohol in the score, the adjusted HR’s comparing patients with 6-8 pts (162; 16%) to 0-2 pts (187; 91%) were: 0.49 for OS (95% CI: 0.32, 0.76; p-trend: 0.002), 0.58 for DFS (95% CI: 0.40, 0.84; p-trend: 0.01), and 0.64 for RFS (95% CI: 0.44, 0.94; p-trend: 0.05). Conclusions: Colon cancer patients with a healthy body weight who engaged in physical activity, ate a diet high in whole grains, vegetables, and fruits and low in red/processed meats, and drank moderate alcohol had longer DFS and OS than patients who did not engage in these behaviors. Support: U10CA180821, U10CA180882, U10CA180820, K07CA197077, R01CA118553, P50CA127003, R35CA197735. ClinicalTrials.gov:NCT00003835. Reageer op "Gezonde leefstijl aanvullend op standaard behandelingen geeft 51 procent minder kans op recidief en overlijden voor darmkankerpatienten"